THE proposed Bedford and Milton Keynes Waterway that was to connect the Grand Union at Milton Keynes with the River Great Ouse at Bedford is under threat. 'The Bedford and Milton Keynes Waterway Trust has been in discussion with the two Local Authorities involved in the scheme, Milton Keynes Council and Central Bedfordshire Council, for well over two years to ensure that the protected route of the Bedford and Milton Keynes Waterway Park is not blocked when the A 421 is dualled. However, all the effort we have put in has been to no avail. The road scheme as proposed will now undoubtedly block the Waterway route. The photograph shows the Grand Union Canal by Campbell Park. The Waterway Park which we and others have been promoting for many years is now at a critical stage. It is capable of transforming the area between Milton Keynes and Bedford and bringing environmental, economic and social benefits for all. It will establish a new sub regional linear park which will create a real sense of place for new developments. New sections of the waterway are being built into Campbell Park Marina and Bedford Commercial Park near Wootton. 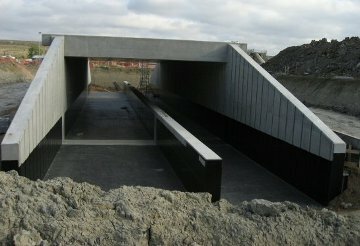 A culvert was included under the A421 Bedford Southern Bypass when it was built and the Waterway Park is central to a scheme for 5,000 new homes in Central Bedfordshire. Current proposals from O&H Properties Ltd will secure 6km of the waterway between Brogborough and Stewartby Lakes. The route is protected in three Local Plans so that no development can block it. Large sections of the land required for the waterway have been transferred to the Local Authorities and are managed by the Milton Keynes Parks Trust and the Forest of Marston Vale until such time as the whole Waterway park can be built. We have asked for a culvert under the A421 to be included in the new upgrade, similar to that provided under the Bedford Southern Bypass when it was built. (Pictured) This would ensure the route of the Waterway stays open, consistent with local plan policies. This would also ensure that there are cycle and pedestrian routes under the road as well. However, the A421 upgrade is going ahead without a culvert and will consequently block the Waterway route. Over £9bn is being made available by the government for road and rail schemes in the Oxford/Milton Keynes/Cambridge corridor which are needed to support growth and the delivery of new homes. Essential as they are, these schemes will have an unavoidable impact on the environment and result in the loss of greenspace along their routes. The Bedford and Milton Keynes Waterway Park could provide an ideal opportunity to mitigate these impacts and create a new linear greenspace at a strategic level, providing people with an opportunity to relax and get away from rushing about on road and rail, something which recent studies suggest is vital to the health and well-being of communities. Investment in greenspace is not seen as such a high priority as road and rail and yet it is a vital ingredient for successful and sustainable communities. The decision to upgrade the A421 without a route for the Waterway is not only against Council policy (no other developer would be permitted to build on the route without ensuring there is a viable alternative) but is regrettably short-sighted and will leave behind sections of what could be a transformational project but with no ability to join the whole route up for maximum benefit. 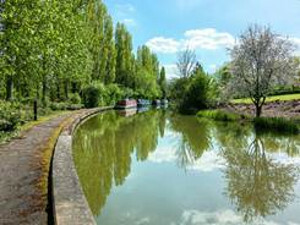 The Bedford and Milton Keynes Waterway Trust hopes that your readers will help us campaign to ensure the future of this fantastic project is assured'.